Channel rainwater from your roof’s canales into hidden catchment basins below for storage. Rainwater harvesting is the gathering and accumulation of rainwater. Rainwater harvesting can be either active or passive. Passive water harvesting is where rainwater is contained on the site where it falls, and is infiltrated into the ground for landscapes and groundwater recharge. Active rainwater harvesting is where rainwater is stored for use at a later date. Rainwater can be used in many ways once it has been stored, i.e. for irrigation, fountains, ponds, animals, and domestic uses for humans. The RainCatcher installs many types of passive and active rainwater catchment systems to help you use this free water source wisely. The benefits of harvesting rainwater (both passive and active) are many! Stored rainwater can sustain a landscape in a drought and saves well water or money on water bills. Collecting rainwater from impermeable surfaces and using it purposefully in the ground allows for the water to be cleaned by the soil’s microorganisms. It also allows that specific area of soil to grow plants that may not survive on typical rainfall alone. Water harvesting recharges aquifers, both shallow and deep. Cisterns come in all sizes and store rainwater either above ground or below for later use. 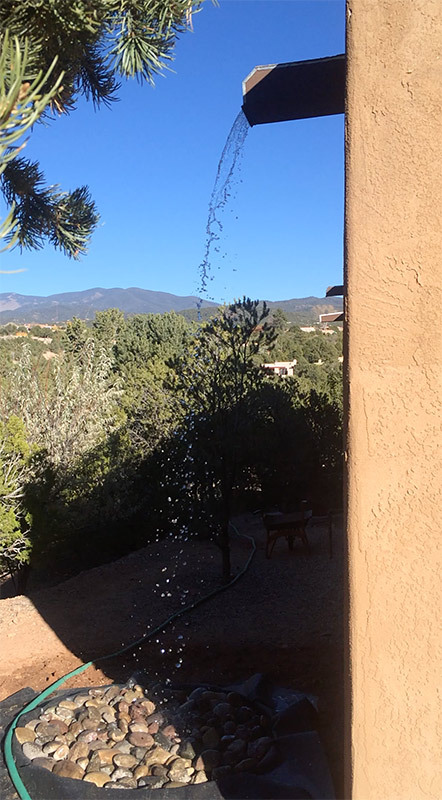 How could we use Santa Fe’s 5.4 billion+ gallons of annual rainwater? 5.4 billion gallons captured and then infiltrated into the ground would help to make the arroyos ephemeral (flow intermittently) and could possibly restore the Santa Fe river. These precious gallons could be used to create shallow aquifers for tree growth and establishment, clean the polluted runoff, decrease erosion in arroyos and mitigate flood issues. A single quarter acre of land in the city can harvest over 100,000 gallons of water per year, eliminating the need for city or county water irrigation and would therefore save money and increase the opportunities for its use. It would create an abundance for plants and the soil, and would support flourishing biodiversity very easily. Water harvesting is a great way to show that your place of work is concerned and making an effort to be more conscious and environmental. Why not grow a fruit tree at the office with the rainwater from the roof? 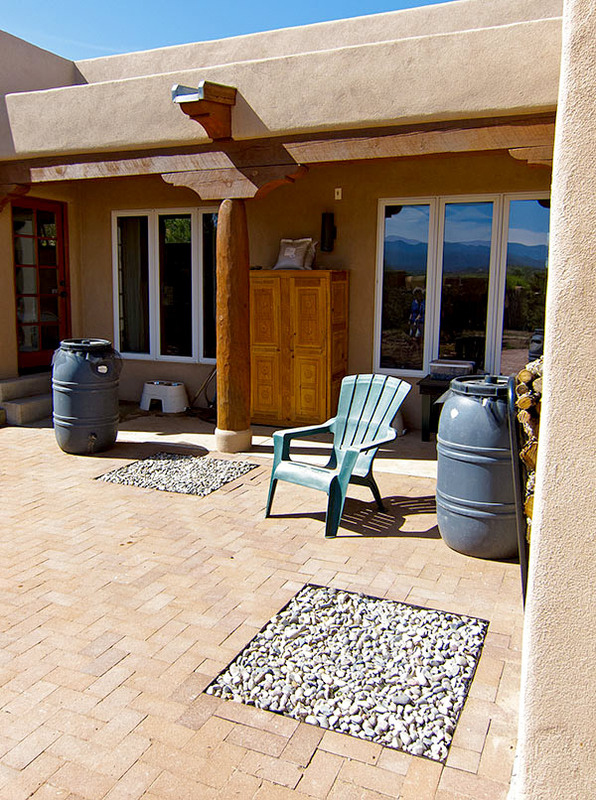 These square catchboxes blend in with the patio and catch rainwater from the canales above for underground storage. What is its cost effectiveness? Passive water harvesting means not letting runoff water leave a specific site. Once it is set up, costs and maintenance are minimal. Active rainwater harvesting on a simple home in the city can save up to 20,000 gallons of water in irrigation purposes annually on a 1,500 square foot home. A commercial property can save 5-10 times as much, and can have a very beautiful landscape because of it. 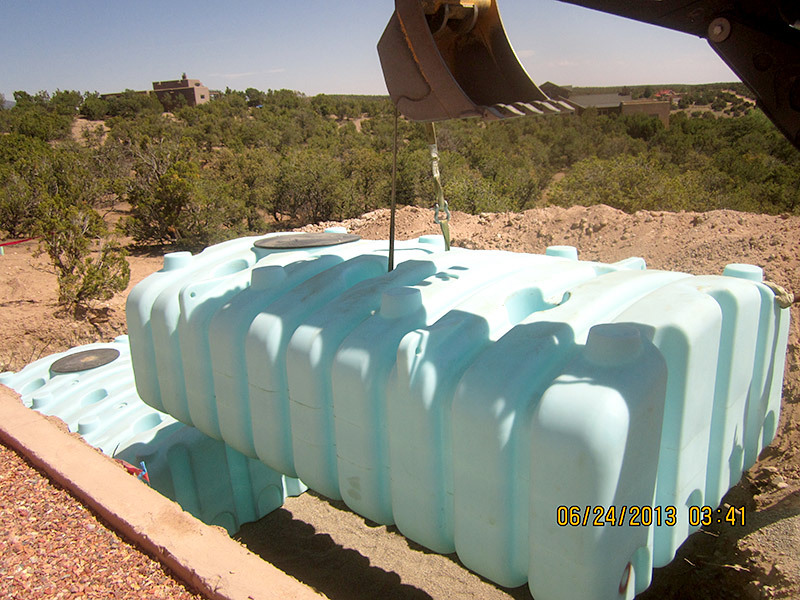 Within the Santa Fe city limits, a .25 per gallon credit is being issued for installation of water catchment systems. What are some techniques for passive rainwater harvesting? Examples of passive water harvesting: Swales, berms, one rock dams, terracing, fish scales, boomerangs, sunken beds to name a few.